Kids will be kids! 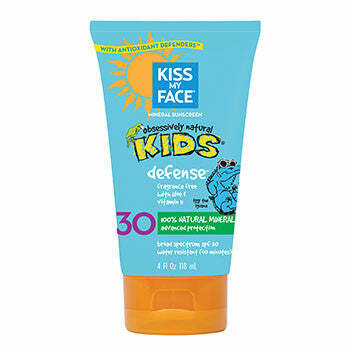 Protect their busy bodies from harmful UV sun rays with our Kids Defense™ Mineral Sunscreen Lotion! . Our Kids Defense™ Mineral Sunscreen also contains nourishing antioxidants (infused with green tea, carrot extract and sunflower oil). It is Hypoallergenic, Water Resistant (40 minutes), and has a natural fresh scent. Zinc Oxide and Titanium Dioxide minerals help reflect UV rays and promote healing from the sun. Antioxidants offer an additional layer of protection to help fight free radicals and decrease the effects of sun damage and environmental pollutants. Broad spectrum sunscreen combined with these Antioxidant Defenders® like aloe vera, green tea, carrot extract , and Vitamin E help reduce inflammation while providing skin hydration with olive and sunflower oil. Please be assured that Kiss My Face (KMF) uses well established testing methods and we have the documentation to demonstrate our sunscreen claims. Testing is stringent, thorough and meets all FDA requirements. Other Ingredients: Aqua (Deionized Water), Aloe Barbadensis Leaf (Aloe Vera Gel) Juice, Helianthus Annuus (Sunflower Oil) Seed Oil, Acrylates Copolymer, Lecithin, Glycerin, Xanthan Gum, Glycine Soja (Soybean Oil), Cocamidopropyl Betaine, Cocos Nucifera (Coconut) Oil, Butyrospermum Parkii (Shea) Butter, Camellia Sinensis Leaf (Green Tea) Extract, Daucus Carota Sativa (Carrot) Root Extract, Agaricus Bisponus (Mushroom) Betaglucan, Tocopheryl Acetate (Vitamin-E), Olea Europaea (Olive) Oil, Phenoxyethanol, Ethylhexylglycerin, Cocos Nucifera (Coconut) Oil, Mangifera Indica (Mango) Seed Butter. Knead product in the tube before applying. Full protection will start after 15 minutes of application. When mineral sunscreen is applied properly, skin will be coated in a whitish tint.